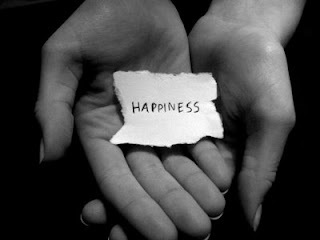 Happiness: It's what everyone wants but too few are able to say they truly live happy lives. Are some of us just luckier than others? Most have an expectation that happiness is going to show up for them somehow, even a feeling of entitlement about it, but do they know how or where it's coming from? Or when it will arrive? Some have excuses they can point to for why it hasn't shown up yet, and they really believe it's not their fault. But where's the power in that? What if we took control of our own happiness and created it for ourselves with habits that produce results? Now that would be empowering! I'm lucky to be one of the truly happy ones. (Well, most of the time - I'm not super-human!) How do I do it? Practice. Yeah, like I think I'm responsible for it. I'm not expecting someone or something to make me happy any more than I'm expecting someone or something to make me unhappy. I take responsibility for creating it for myself every day, over and over again. It's the only real, sustainable happiness there is. It's not always natural and it's not always easy. But is it worth it? Absofuckinglutely. Because I'm worth it. Happiness is something that spills over into everything else in our lives. It affects how we do anything - and how we do everything. It reaches those we have contact with, those we love, those we work with, and those we live with. It feels good, looks good and it's contagious. Why wouldn't we want to be happy? And if we're going to be having an impact on those around us anyway (and we do!) shouldn't we be deliberate about it? Figuring out what makes us happy is tricky. It's important to define what happiness is for each of us, and it's not the same for everyone because we're not all the same. "Don't believe everything you think" was sort of how I approached it. It was a real surprise that when I essentially took everything out of what I thought it should be or look like, it was like emptying out the overstuffed closet, then put it all back together the way I wanted it to be - the way I saw it without blindly accepting what I had been taught or told or expected, it looked very different. And it felt comfortable, like it belonged to me. I didn't want to keep someone else's idea of what happiness is without examining it thoroughly for myself. I'm still "trying things on" everyday. Sometimes they work for me and sometimes they don't. It was this single exercise that gave me the biggest breakthrough in being happy consistently. I continue to question everything before accepting it as my own and I encourage everyone to try things on for themselves. You can always change it up. I like to keep it simple. I once had a career coach who presented an exercise in gratitude that I've maintained ever since. It's one of two highly effective tools I have for creating my own happiness. She called it the "10/10" list. On one side of the paper I was to write down 10 things I'm most grateful for, on the other side, 10 things I want the universe to bring me. (I didn't have to have a clear understanding of how those things would show up. I was just letting the universe know they're on my radar.) She said the 10/10 list could change as often as I like, even daily. Since then I've found that the first column stays basically the same. The other column, the one I want the universe to bring me, changes more often but always includes three things: "perfect clients" (nice people who appreciate my work), a place I want to visit, and something new I want to learn. Sometimes it lists more immediate goals or needs, often times it's about what I want for other people but mostly it's a list of those things that bring me joy and satisfaction. Just the exercise of thinking about it and writing it is inspiring for me. Then I keep it handy, near my bed, and I look at it and re-read it from time to time. She instructed me to read it daily and sometimes I do. It makes such a difference! One year I wrote that I wanted to become more globally aware. I subscribed to papers that covered world news, joined an organization called "The World Affairs Council" and started attending their speaker presentations, and basically kept myself open to finding interest in the rest of the world. It made for interesting conversations and some self-reflection. Of course not all of the news is "rosey" or inspiring - some of it is quite upsetting - but overall, as an experience, I'd rate it one of the best things I've ever done for myself. I didn't do it necessarily to find happiness, I did it for knowledge. And guess what? It makes me happy to be informed. The second thing I do is make a vision board. Visualizing it in my mind is what gives it momentum. I make one every year. It's a piece of black foam core poster board. On it I'll put up clippings that I've collected over the year in a file folder. Pages torn from magazines that represent a healthier lifestyle, quotes that inspire me (those are really powerful! ), always some flowers because I love them and admiring the simple, beautiful things in life are precious to me, usually some goal oriented images whether they're stylish things to wear or home projects I want to tackle, destinations I want to travel to, and it all comes together into a beautiful, colorful collage that I keep in my dressing area at home. So when I'm getting ready everyday, I'm reminded of what makes me happy and the track I'm on to achieve whatever it is I'm after. I've kept these boards over the years. They line the top shelf of my wall to wall closet. They're not just beautiful to look at, they're effective. I can point to each image and remember what it meant to me and how it became a reality, and I'm grateful and inspired all over again. It reminds me that I had a hand in all of the good stuff that showed up, and how lucky I am. Disgraceful adjective shameful, shocking, scandalous, mean, low, infamous, degrading, unworthy, ignominious, disreputable, contemptible, dishonourable, detestable, discreditable, blameworthy, opprobrious, without grace. I've been observing the Tea Party and their campaigns, views and choices since before the presidential election in 2008. I keep looking for what I must be missing - the part that makes sense. I completely understand the disapproval of the way things have typically been done in Washington, and the business of politics. I understand wanting to "shake things up" over there and get things done the way that Americans agree they should be done, but that's where I get stopped. This group doesn't seem to really represent what Americans agree should be done, not as a majority. The polls are pretty clear about this. The Tea Party is consistently driving their personal agenda of swaddling most of their decisions and opinions in religion and making no apologies for it. There are many examples of this but the one that struck me last Thursday was when a handful of freshmen Congressmen - the one's that the Tea Party endorsed and helped get elected to office - stepped out of the debt ceiling negotiations to go into the chapel to pray for answers. They were leaving their voting decision to God. Really? Is that what they were elected to do - pray? Surely someone told them they were supposed to be paying attention to what's going on and representing their constituents, right? So not only aren't they doing the job they were elected to do, but they are getting paid to sit in a chapel and pray and bring THEIR faith into OUR government process? That's disturbing to me. The entire Tea Party's influence is clearly disproportionate to the wishes of the majority of American people, yet there it is, and it's inhibiting all the good work that could be getting done by standing in the way and insisting on unreasonable demands shaped by narrow-minded religious views. Is that what God wants? I'm not against religion. I'm not against faith. I believe everyone is entitled to the freedom to choose to believe in whatever they want to and to worship however they please, privately and keeping their practices legal. I don't have to agree with them but if that's what they want to do it's okay with me so long as they aren't imposing their beliefs on others. I'm against mixing religion and faith into our government in a way that doesn't serve everyone fairly and positively, or restricts personal rights and freedoms. I'm also against the big business of religion getting away with the tax loop holes that only religion can. Religion, as a cornerstone of any elected officials' platform and it's influence on their decision making when it comes to government policies, seems to me to be inconsistent with the business of governing a country of people as diverse as ours, especially when it comes to faith. Morals and ethics are not exclusive practices to religion or the religious and they are not found in a chapel. They are available to everyone. Everyone who chooses to practice them. I don't mean to single out just the Tea Party. Certainly poor choices are not exclusive to them. I find myself wondering; if the Tea Party, or anyone for that matter, is going to mix religion and politics, what's the benefit for everyone? Where do Tea Partier's morals and ethics really lie when those who believe so strongly in their faith and their religious institutions make such underwhelming contributions to the solutions in our country? And why is God allowed to grow richer at everyone's expense? 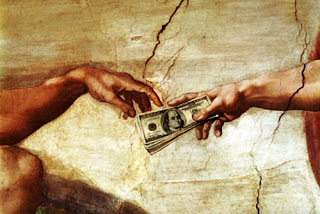 Religion received 35% of all the charitable donations, or over $100 billion just last year, with an additional non-cash donations of another $18 billion+. http://www.nps.gov/partnerships/fundraising_individuals_statistics.htm and it keeps going up, year after year. Oh, and unlike any other business, religion and faith-based charities depend largely on volunteers to keep their organizations running and profitable. That's right, so it isn't a taxpayer, it doesn't provide charitable services for everyone and it isn't a job creator. So here's what does make sense to me: Taking the narrow-minded religious views that are not shared by the majority of voters out of our country's policy making and taxing religion just like any other business, because that's what religion is, BIG business. Then it would gracefully be contributing to good for all of us. And from what I've learned from religion, God would want it that way.